How do you build a time machine putting together performing arts, cultural heritage, and ultra-broadband networks? GARR and internationally acclaimed director Giorgio Barberio Corsetti exploited the brand-new fiber optic connection to the Italian research and education network of major archaeological sites in Rome to create a unique live event, entitled “La Nave Argo”. The occasion for this innovative performance arose a few months ago, when all the sites of Superintendence for the Rome Archaeological Area – including among others the Colosseum – were interconnected to GARR through fiber-optics, marking a first in the history of the research and education networks in Europe and probably in the world. Conceived to celebrate this event, “la Nave Argo” (“the Argo Ship”) revisits the myth of the Argonauts playing with time and space, reality and virtuality. The real-time of the performance blends with the mythic time in which Jason and the other characters move, and the different spaces in which the actors move are accommodated in a new “virtual” space, that of the network. Thus, in this new dimension time and space are transformed and take an unconventional, suspended, “risky” form. 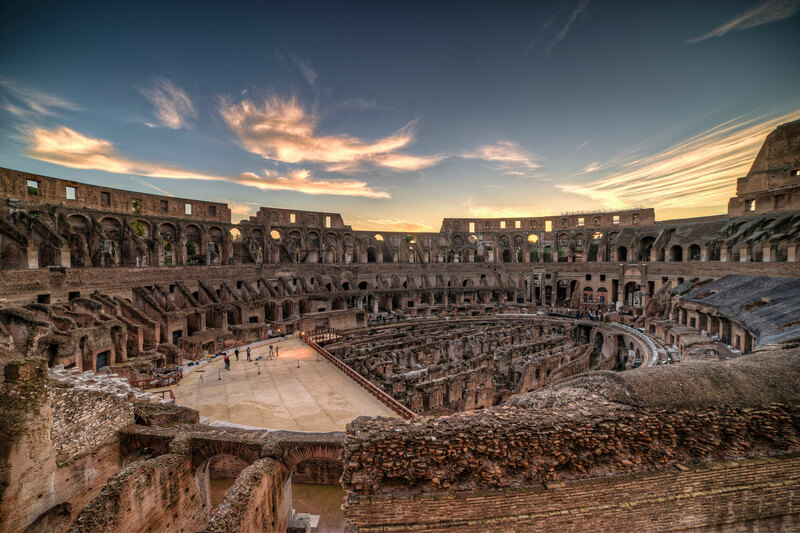 The performance was played in 4 different locations, the Colosseum, the Crypta Balbi and the Octagonal Hall of Diocletian’s Baths, and INFN Frascati (the oldest research facility in Italy for nuclear and particle physics), that become a single stage for the duration of the play, thanks to the network. Actors and musicians interacted in real time from the different sites with the aid of headphones and monitors, using LOLA, a ultra-high definition audio and video streaming system developed by GARR in collaboration with the Tartini Music Conservatory in Trieste, which can reduce latency virtually to zero (or, more precisely, the propagation time of light in the optic fibers). The ideation of the event in all its aspects, artistic and technological was a joint endeavor by Corsetti and his team and GARR, which brought together very different background and competences. Preparations took about a month and saw the collaboration of multimedia experts from the GARR Netcast community. GARR director Federico Ruggieri describes a challenging and greatly satisfying experience. “As is often the case, when everything works the public does not notice the significant technical work that goes into it, but this is the value of a network that is ‘transparent’ for its users”. The event was an opportunity for the cultural heritage community to come together and discover how the potential of ultra-broadband comes alive through the vision of a world-renowned artist, but also .underscored the added value of a multidisciplinary network such as that provided by GARR. “A leap into the future” was Superintendent Francesco Prosperetti’s comment, “which shows us how the network is not only a tool for researchers but also a key enabler of the creative spirit”. The collaboration between GARR and the Special Superintendence dates back to many years ago and is deeply rooted. “Ours is truly a “Special” Superintendence,” says Prosperetti, “we have many sites in our organization, and sharing data and applications is part of our daily life, and essential to our research”. The SITAR system – a multi-dimensional archaeological database that allows recording Rome’s enormous archaeological heritage and the research materials on them as well as keeping trace of related restoration and urbanistic interventions, which relies on GARR for connectivity, storage and digital identity management, is but an example. However, in order to make the best of the new opportunities disclosed by the interconnection, there is still a lot to do: “The technology is ready but not the mindset” commented the Superintendent. “In the US it is normal for researchers and academics to access their museums’ databases not just for research but also for teaching purposes. I would like to extend access to our tremendous wealth of resources, they are extraordinary and unique items that should be shared through collaborations with universities and schools”. Prosperetti also speaks of digital infrastructures to enhance tourism: “We must provide high quality content to promote thoughtful tourism. In this way the network is not just a physical tool but also an indicator of our civility, as we collaborate with a growing number of institutions to maximize the sharing of knowledge”. Research, conservation and experience of archaeological artifacts through the network are thus keywords for the future of cultural heritage, but a great potential also can be disclosed for performing arts, as the performance ideated by Corsetti demonstrated. According to Federico Ruggieri, “with the great potential of fiber-optics the only limits are those of the imagination. Today we opened an avenue and we will continue to support performers who wish to explore these techniques in their artistic research”.